This meal is a combination of two different southwestern favorites – tostadas and fajitas. The portabella mushrooms add a “meaty” bite. Then there is the freshness of the tomatoes, avocado, cilantro and the squeeze of lime. These tostadas make a great light supper or they are perfect for lunch. Top with your favorite garnishes and enjoy. Place tostada shells onto baking sheet and warm shells in oven. this only takes a few minutes. In a large pan over medium-high heat add fajita mix veggies and 1 tsp of Smokey Southwestern Seasoning. Add vegetable broth as needed to loosen veggies from pan. Cook veggie mix until they begin to soften. Add mushrooms, Smokey Southwestern Seasoning, and garlic. Stir. 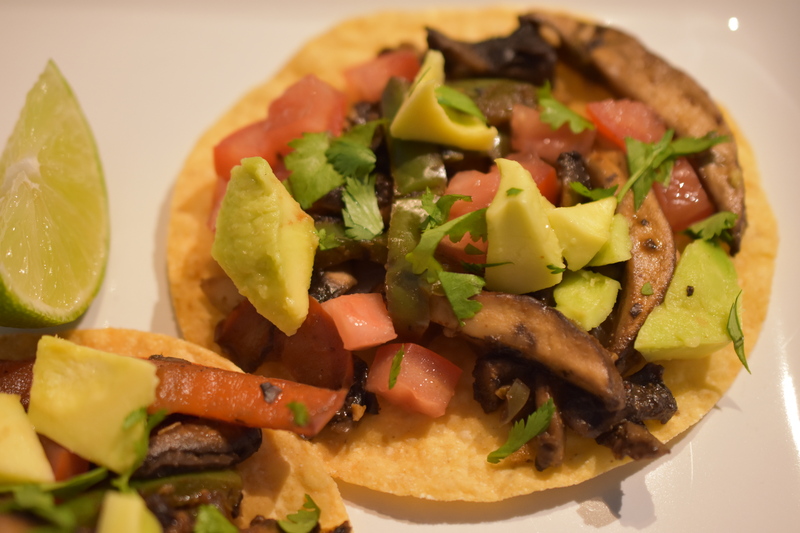 Top tostado shells with portabella veggie mix, tomato, avocado, cilantro and a squeeze of lime. Thanks for stopping by Mistimaan.